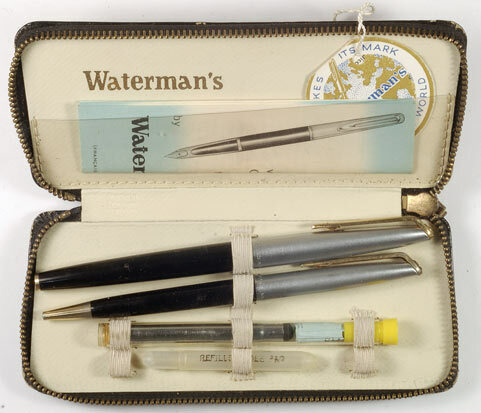 The Waterman C/F was the original US-based Waterman company's last significant design. Continuing a trend of pen companies hiring big-name industrial designers -- exemplified by Henry Dreyfuss' work on the Eversharp Skyline, Raymond Loewy's on the Eversharp Symphony, and Laszlo Moholy-Nagy's for Parker -- the Waterman C/F was styled by Harley Earl, best known for his automotive work for General Motors. Introduced in 1953, the C/F was the pen that made the resilient plastic ink cartridge the modern standard in filling systems. While the Italian LUS Atomica introduced a plastic cartridge slightly earlier, and pens using prefilled ink cartridges of glass or metal go as far back as the 19th century, it was the C/F that transformed the market. It was an immediate and lasting success, an international bestseller that remained in production for some three decades, manufactured in the USA, UK, France, and Canada. Though a milestone model, the C/F has not received much collector interest. Perhaps as a cartridge-filler, it is seen as falling on the modern side of the vintage-modern divide. Most C/Fs are cleanly styled but not notably fancy, later French and to some extent English production excepted. Versions were offered at lower price points as well, including steel-nibbed economy models and basic gold-nibbed models lacking the distinctive swooping section overlay. Though light in the hand, these pens were all well constructed, the only real weak point being the vulnerability of the section overlay to corrosion. For this reason, many C/F users avoid dipping the section when using a converter, filling the detached converter from the ink bottle instead. Despite the large number of extant C/Fs, Waterman stopped production of C/F refills some years ago. Although original cartridges can be refilled with a syringe, the more practical option is a C/F converter. Even these may require some searching to find, and prices can vary widely depending on the seller. Some users have successfully used other refills with their C/Fs, but results seem to vary from pen to pen. At the top of the C/F line are the models with metal caps and barrels produced in France in response to the success of the Parker 75. These were offered in a range of attractive patterns, in gold plate, silver plate, sterling silver, and even solid gold. Mostly found in France, they are now increasingly sought after by collectors worldwide.